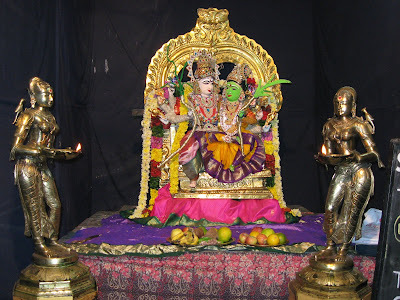 The seventh day of Navaratri, the temple decoration was that of SIVA – KAMESHWARI or Kameshwara- Kameshwari, as they are also known. Kama – the god of love was burnt to ashes when he tried to make the meditating Shiva fall in love with Parvati, born as the daughter of the mountain king, Himavan. When at last Shiva married Parvati after years of austerities, he also brought back Kama to life. However, at the same time, an Asura by the name of Bandasura was born from the smoke. The Devas pleaded to the Devi to rescue them from this Asura, and she appeared in the form of Kameshwari, and put an end to Bandasura. 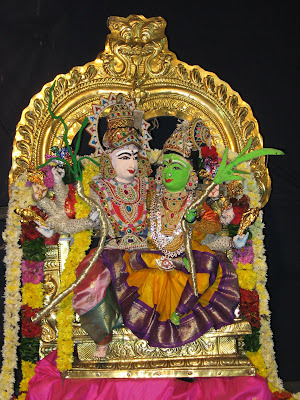 Siva married her as Kameshwara, and this is the form depicted above. I have also appended a Tanjore painting of Kameshwara and Kameshwari (which I found on the net) so as to understand this depiction better. Well, that’s all for today. Looking forward to being back tomorrow with (hopefully) more photographs….